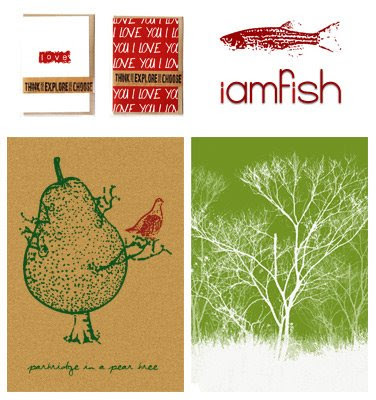 Another great addition to the eco-friendly marketplace is passionate paper goods company iamfish. Based in northern New South Wales, the team at iamfish live and breath their 'fishosophy': Think. Explore. Choose. Think about the impact of your decisions. Explore the possibilities. Choose to make a difference. With a desire to bring environmentally friendly products to market, they have launched a great line of stationery including greeting cards, bookmarks and gift tags. All printed on post-consumer recycled paper with soy-based inks using a waterless printing process. And with hip designs to boot, it becomes very easy to choose iamfish for your paper goods needs. You can find iamfish stationery products at stockists around Australia and online. great papergoods - i love all things paper!! Beautiful Stuff! Congratulations on being chosen "A Blog of Note". Well deserved. hey .. nice blog. can you teme how you got the sponser links on your blog? Also, the facebook and twitter options on the right hand side? how do we get that to our blog? I had to check out a blog of note titled Bondville since that's my maiden name. Because you are interested in products made from recycled materials you may be interested in the book Hot, Flat, and Crowded: Why we need a Green revolution - and how it can renew America by Thomas L. Friedman. Mitigating climate change,energy poverty, petrodictatorship, and biodiversity loss are the main topics. The book is an eye opener to say the least. The Earth has no hope - why do you think I moved out here to outer space? Hi AnastasiaC - so glad you like it. Hi Valerie 007 - my last name is Bond (yours too?) so thought that Bondville would be a fun name for the site. Thank you for the book recommendation - I will check it out. Hi everyone else - thank you so much for visiting from Blogger's Blogs of Note. I'm really honoured to be profiled and hope that you are all able to stop by from time to time. nice. very cool looking stuff, and enviro-friendly. thanks for the intel. I love all of the stationary on the site you offered. It's wonderful! Great find, thanks for it. Thanks Brian and Across the Sound. It's lovely stuff.